Treating multiple signs of aging without surgery has never been easier. The SmartSkin Micro Ablative Laser is a fractional CO2 laser that is engineered to deliver customizable laser energy in a safe and efficient manner. The face and neck are the obvious areas that the SmartSkin laser targets, but any area of the body with these skin conditions can benefit. The chest, hands, and arms are areas that are frequently sun damaged, and the SmartSkin laser can make a dramatic improvement by removing much of the unwanted pigment and age spots, and smoothing the texture of the skin. Although it is not comparable to the effects of a surgical facelift on lifting and tightening skin, there will be some tightening of the facial and neck skin. Depending on your age and skin condition, this alone can be dramatic. 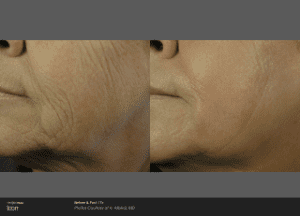 The transformation that the SmartSkin Micro Ablative laser can achieve could take years off of your appearance. Although the improvements to pigmentation and fine wrinkles will be seen almost immediately, the SmartSkin CO2 laser procedure will continue to improve your skin over the next several months. This is because the SmartSkin CO2 also stimulates neocollagenesis, which means that the skin will be prompted to produce more collagen, a process that begins within 30 days of the procedure. This added collagen causes the skin to be thicker, which makes it appear more youthful. Even the redness of blotchy skin or mild rosacea can be improved, and many vascular skin problems on the face such as angiomas or telangiectasis (“broken blood vessels”) can be improved at the same time with another of our laser devices, the Icon. Scars cannot be eliminated completely, but can be improved with the SmartSkin Micro Ablative CO2 Laser. Even established acne scars and stretch marks can be improved; expectations have to be tempered, but any improvement is generally welcomed in these very difficult problems. Facial rejuvenation surgery doesn’t address sun damage or textural changes to the skin, nor does it stimulate skin thickening by neocollagenesis. 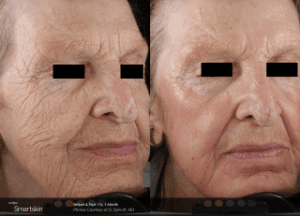 These aspects of facial aging are often ignored when patients consider facial surgery. The best approach when considering facial surgery is to consider treating those problems in a comprehensive way. The Smartskin Micro Ablative Laser is the answer. Intense Pulsed Light and proper skin careare also valuable adjuncts to rejuvenation. You will meet with our esthetician, and an aftercare program and skin care products will be included with your SmartSkin Micro Ablative CO2 Laser procedure. The SmartSkin laser procedure is done in the office and usually takes less than an hour, depending on how may areas are being treated and the severity of the problems. Discomfort is minimized with topical anesthetic and a cool air device. We will offer a mild oral sedative if desired. After the procedure, discomfort is mild or nonexistent, and Tylenol or Advil is usually enough. Recovery can be as mild as some redness for a couple days, or may involve several days of peeling and redness, depending on the treatment. The aggressiveness of the procedure is usually commensurate with the severity of the problem. Getting the maximum result with only one treatment will minimize cost, but the recovery will be longer. A less aggressive treatment will minimize downtime, but the results will not be as dramatic and the treatment will likely need to be repeated. How does the SmartSkin Micro Ablative CO2 Laser System work? The SmartSkin Micro Ablative CO2 Laser System delivers a series of tiny microscopic laser beams to a fraction of the skin. This fractionated energy penetrates the skin, which helps to clear away old and damaged skin cells. The body’s natural healing process then builds new healthy cells to take their place, from the adjacent un-lasered skin. The laser also stimulates the production of new collagen deep within your skin, giving you a more youthful looking appearance. Typically, only one treatment is needed for desired results. However, since the treatments can be adjusted to your cosmetic and downtime needs, you can also opt for two or three “lighter” treatments, or supplement the SmartSkin with IPL treatments. We can help you determine which course of treatment will work best for you and your individual needs during your consultation. We apply a topical numbing anesthetic to your skin prior to the procedure and also offer medications to help reduce discomfort during your treatment. We also use a chiller to cool the treatment area during the procedure, which makes the treatment more comfortable. With proper skin care, protection, and maintenance, results often last years. Immediately after the treatment, your skin will feel warm and appear to be sunburned. You may experience pinpoint bleeding and swelling, which is completely normal. Your body naturally starts working by replacing the aged skin cells with new ones. The “downtime” will vary depending on the settings used, which will be determined taking into account your cosmetic expectations and downtime needs. Over time, collagen will regenerate and restore the supporting structure of your skin, giving you the smooth skin you are looking for. This process can take up to 6 months, and your skin will continue to improve during this time period. Since the SmartSkin Fractional CO2 Laser delivers micro pulses of energy into the skin, you will experience a significantly shorter recovery time than with fully ablative lasers. Each tiny hole will quickly heal, and in a few days you can return to your normal lifestyle. Treatments are adjustable, so your downtime will depend on the treatment you receive. Areas where the skin is more delicate (neck, chest and hands) may take about an extra week or two to fully heal. Fractional skin resurfacing with the SmartSkin CO2 has a faster recovery and has fewer side effects when compared to fully ablative resurfacing. Treatments are generally well tolerated. During your consultation, we will explain any potential risks and help you minimize them based on your complete medical and skin history. Call our office today to schedule your consultation for SmartSkin!